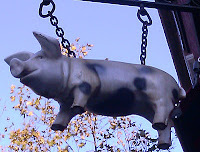 The Spotted Pig was high on the list of most of the New York burger review sites, which I had read. I had tried to go the previous evening, but a 2-hour wait for a burger was not going to happen. I chose a less busy time the following day, and I was seated immediately. Service was friendly and prompt. I ordered the $17 Chargrilled Burger, and settled in for a 25-minute wait. During that time I learned about the burger. I also enjoyed watching the endless parade of kitchen staff shuttling food from the basement storage area, through the dining area, and into the kitchen. In New York, things are different. 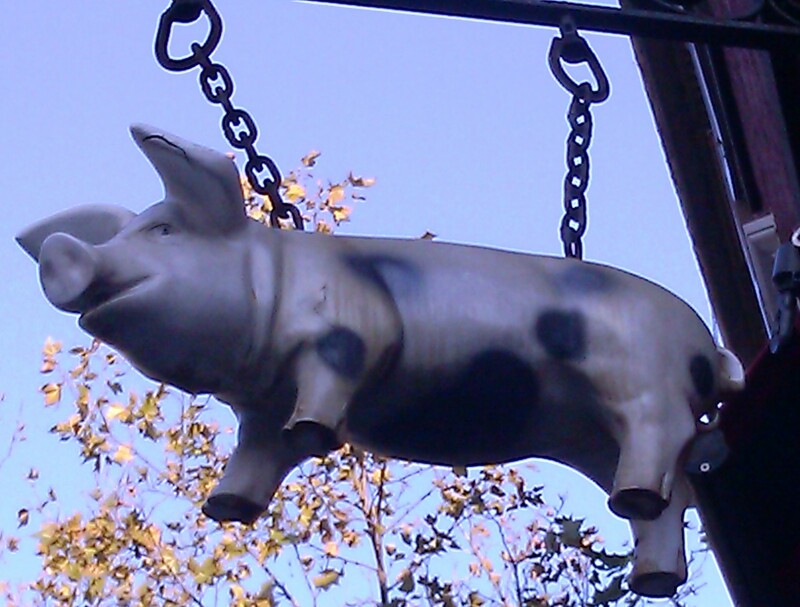 The Beef: The Spotted Pig worked with a blend of Pat La Frieda-sourced cuts. The burger incorporated Brisket, Short Loin, and Chuck. The flavor profile was mellow, and the Brisket was the flavor that dominated. While very competent, I had hoped for something a little more aggressive in terms of beef flavor, but what I got was a really subtle and thoughtfully prepared burger patty. The fat content was high, but it was well-balanced by the juiciness on the burger. I pegged the fat around 25%. There was only a mild taste of funk from aging. The texture was springy and moist. All told, this was a very smooth tasting burger. However, this was only determined by eating parts of the burger not covered in the Roquefort cheese. The cheese overpowered the mild beef. The Seasoning: The seasoning was appropriate to the mild flavors of the beef. The savory blend was applied as the patty cooked, and and it served to round out the mild flavors of the carefully constructed burger. The Sear: The menu promised a Chargrilled Burger, but the only char that I found was on my bun. The beef was treated to a lackluster set of grill marks. The thick patty certainly could have taken on a competent sear without over-cooking. Still, this was in keeping with the theme of mellow restraint at The Spotted Pig. The grill marks imparted no interesting flavors or textures to the dish. The Preparation: The burger making process at The Spotted Pig was laudable. The Pat La Frieda beef was ground and gently blended in house. The burger patties were carefully hand-formed into beef pillows a day in advance and allowed to rest for at least 24 hours. During morning a prep a test burger was cooked, and if the test burger was not perfect, then the beef was allowed to rest even longer. The gentle handling ensured that the burgers did not become chewy. The long rest period allowed the copious fat in the burgers to thoroughly re-incorporate so that the burgers would not be greasy. The burgers were cooked on a too-cool gas grill. I imagined that this was intentional, but the effort fell flat in terms of flavor, texture, and presentation. The kitchen sent out a perfect Med Rare in keeping with my request. 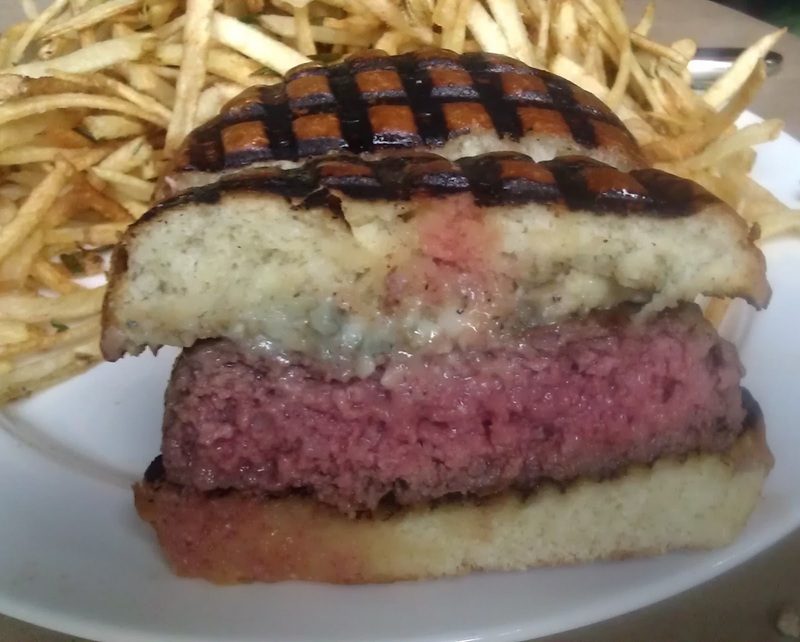 The 8-ounce patty was cooked so evenly that it gave the appearance of having been cooked sous vide. The Cheese: The decision to top such a cautiously crafted and gently flavored burger with Roquefort cheese was puzzling at best. It was like projecting Ansel Adams photos at a speed metal concert. The juxtaposition was jarring to the point that the beef was utterly lost in the salty tang of the soft, white cheese. I found this to be an epic misstep. The Bun: The top of the bun was charred, and this lent an unwelcome bitterness of burned starch to the bite. Otherwise, the brioche was bland and relatively neutral. It lacked any discernible crispness. The unseared, moist beef coupled with this bun and the creamy cheese made for a very tame mouth feel. This dish needed something by way of texture to liven it up, and the bun was not up to the task. The Meat To Bun Ratio: This was good. The brioche caught all of the juices without becoming soggy. The mild bun did not detract from the bite--it was barely noticed. The Fries: The shoestring fries were cut in house and served peel-on. They were thin enough that they did not require par-cooking. The fries were cooked in vegetable oil and finished with rosemary and salt. The seasoning was perfect, and the fries were difficult to put aside. The Toppings: There were no toppings, and that was just fine. The Value: $17 for a cheeseburger borders on absurd. The ingredients were of high quality, but the preparation, combination, and assemblage simply did not support the price point. The cheeseburger at The Spotted Pig was half fantastic. The beef was delicious and well considered. The cheese was a nightmare, and the bun was dull. The price was too steep when these factors were all taken into consideration. I would recommend trying this burger without the cheese. 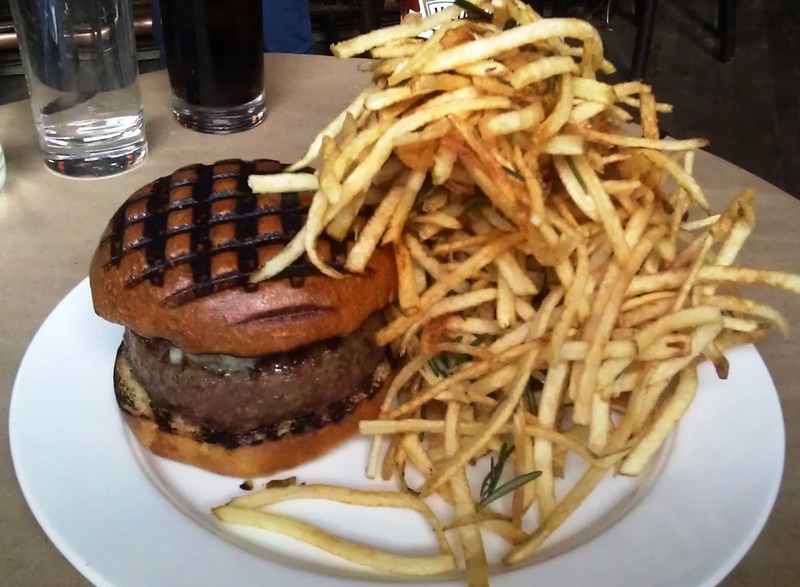 Burger Review : Tasty and thoughtfully handled beef at an overly high price at The Spotted Pig. That charred bun top looks as it would taste, bitter. Your last photo captures how not only the top sliver was burnt, but burnt throughout the crust. There should be a burger designation between Pub Burger and Diner Burger to describe a size in between those styles. Your use of "pillow" might do the trick. I could see a family playing 21 Questions on a road trip. Dad: "OK kids, what's BIGGER than a Diner Burger but SMALLER than a Pup Burger?" Kids: "Oh that's easy daddy, a PILLOW BURGERRRRRR!" Restaurants shouldn't serve fries that look like they've been dumped on your plate with an earth mover. It looks low and absurd. Your delicate sensitivity to burgers seems to carry to fries as well. You're really a burger AND fry critic. You often note that seasoning was applied to the meat as it cooked. How do you come to know this? How would a rest period for formed patties differ from a rest period for the unformed ground beef? Wouldn't the "re-encorporation" of fat occur in either state? Knowing that they used Roquefort, I'm a little surprised that you didn't order it without this strong cheese, in keeping with your desire to avoid flavors that interfere with your communication with the beef itself. The way you described the beef throughout your review does not jive with your summary judgment of the beef as "delicious". As noted on a previous date, such schizo inconsistency is jarring...to say the least. "Delicious but understated" would have been more accurate. I enjoyed the subtlety of the flavor and texture. I wanted more, but what I got was pretty darned good. That was the fault of my expectations, not the dish. 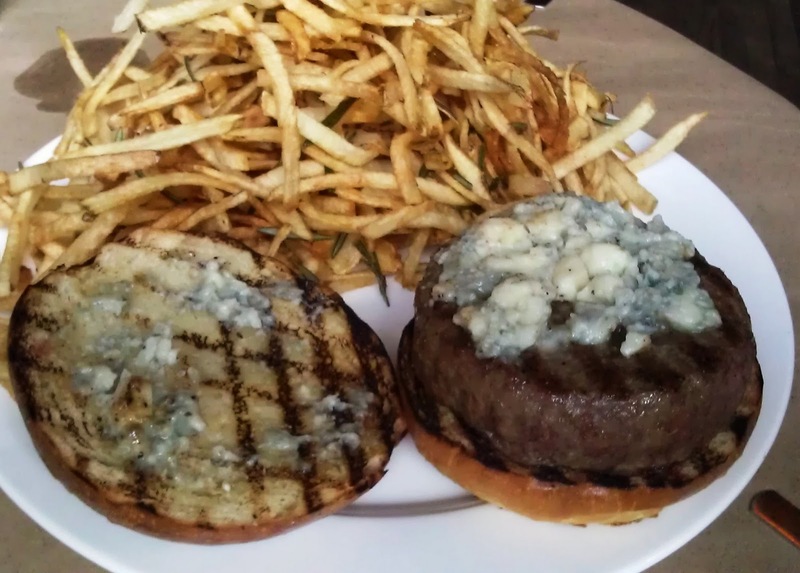 The Roquefort was the sole choice, and this was the burger that got the rave reviews. It was simple enough to scrape it off to savor the delicate beef. The fat re-incorporation would occur, but without a rest period the proteins would not knit to create the delicate springiness, which this burger exhibited. The seasoning...it was absent from the interior of the patty. 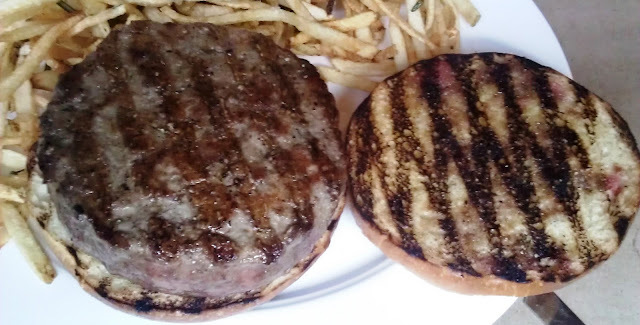 Since the patty's exterior was not rubbery, it was simple to deduce that the seasoning was not applied beforehand, and since no salt granules were in evidence, it was clear that the patty was not seasoned after it left the grill.